The entire team here at Staff Carpet is committed to caring for our community and giving what we can. Our philosophy is that by working to make the world a better place for those in need, we make it better for us all. In this spirit, Staff Carpet contributes to many local charitable organizations and causes. If you're interested in contributing, we invite you to join us in our efforts to improve the lives of those in our community. For 33 years, Staff Carpet has been part of a group of local businesses that have come together to organize the Caddyshack Golf Open. Each year, the event raises money for local organizations. In 2017, the proceeds went to The Boys and Girls Club of Central Illinois, Basket of Hope, and the University of Illinois Springfield Athletic Department. 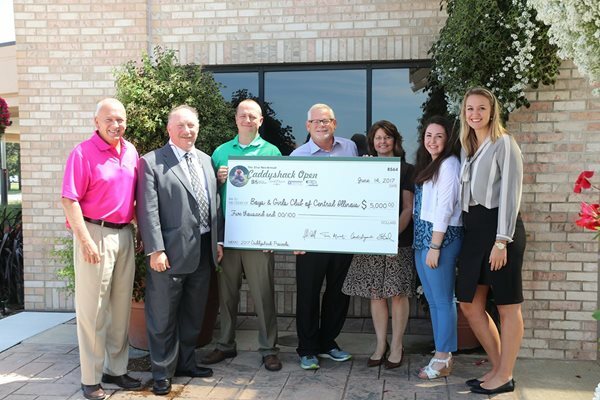 Along with Staff Carpet, other local businesses that have kept this annual golf outing a tradition all these years include Bank of Springfield, Giganti & Giganti Fine Jewelry, and Midwest Office Supply. Every year since August 2017, we've run the Staff Carpet Teacher Rug Giveaway. Thanks to the help of our employees and a team of volunteers, we have been able to hand out more than 1,500 rugs to local teachers, some of whom began excitedly arriving for the event as early as 6 a.m.! It's always an awesome day full of appreciation for, and gratitude from, our teachers! Thanks to our fellow local businesses for getting involved in the event and donating raffle prizes, giveaways, food, volunteer hours and promotional radio time! 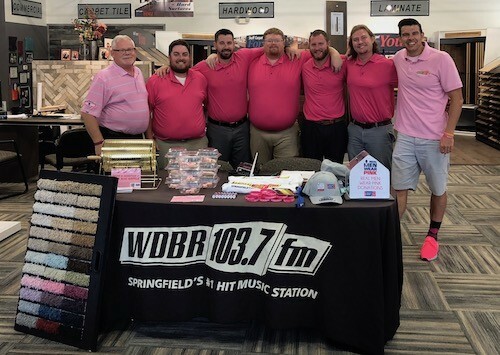 In the fall of 2018, our owner John participated as a candidate for Real Men Wear Pink. He helped raise funds and awareness for breast cancer research. He was the recipient of the “Most Awareness” award for all of the effort he put in to raising awareness via radio shows, email, and other media! We've donated flooring, both for homes and for their Habitat ReStore. Staff Carpet helps raise funds and collect food for the food bank each year through the Cooperate Food Fight Challenge. It is a fun competition between local businesses that encourages employees and customers to donate to help fight hunger in our community. Shaw Floors got us involved in this organization through their carpet pad program. Over the years, we've sent our employees to visit St. Jude to learn about their work. Several members of our team have since made yearly, personal donations to the local St. Jude Radiothon. In 2019, Staff Carpet sponsored the St. John’s Children’s Miracle Network Radiothon. John and Kim Staff made a live, radio pledge to help with the raising of funds for new advancements that St. John’s Children’s Hospital is working on.